• Harbaugh, A.W., Banta, E.R., Hill, M.C., and McDonald, M.G., 2000, MODFLOW-2000, the U.S. Geological Survey modular ground-water model -- User guide to modularization concepts and the Ground-Water Flow Process: U.S. Geological Survey Open-File Report 00-92, 121 p.
• Hanson, R.T., Boyce, S.E., Schmid, Wolfgang, Hughes, J.D., Mehl, S.M., Leake, S.A., Maddock, Thomas, III, and Niswonger, R.G., 2014, One-Water Hydrologic Flow Model (MODFLOW-OWHM): U.S. Geological Survey Techniques and Methods 6–A51, 120 p., https://dx.doi.org/10.3133/tm6A51. The Discretization File is required in all models. Certain packages or processes including HUF2 and GWT may place restrictions on the allowable discretization. Discretization information is read from the file that is specified by "DIS" as the file type. Item 0 is optional—“#” must be in column 1. Item 0 can be repeated multiple times. Text—is a character variable (199 characters) that starts in column 2. Any characters can be included in Text. The “#” character must be in column 1. Except for the name file, lines beginning with # are restricted to these first lines of the file. Text is printed when the file is read. NLAY—is the number of layers in the model grid. In MODFLOW-2000, the maximum number of layers is 999. In MODFLOW-2005, there is no fixed limit to the number of layers. NROW—is the number of rows in the model grid. NCOL—is the number of columns in the model grid. NPER—is the number of stress periods in the simulation. If the Farm process is used and IRTFL is set to 3 or ICUFL is set to 3, ITMUNI must be set to 4. If using the DAFLOW package, make LENUNI consistent with the value specified for IENG. the X Cartesian coordinate the model cell center at Row 1, Column 1. This option is only available in MODFLOW-OWHM. the Y Cartesian coordinate the model cell center at Row 1, Column 1. This option is only available in MODFLOW-OWHM. the Polar angle in degrees of the model grid measured in the counterclockwise direction. This option is only available in MODFLOW-OWHM. COORD_OPTIONS is a character variable that is scanned for keywords (separated by one or more spaces) that specify coordinate options. Unrecognized words are ignored, and a word may be specified in either uppercase or lowercase. A blank record is acceptable and indicates no options. The following are recognized keywords. • CORNERCOORD is an optional coordinate keyword, without quotes, that when present indicates that XFIRSTCORD, and YFIRSTCORD refer to the model cell’s outer most corner (that is, NOT the cell center). • PRINTCOORD is an optional coordinate keyword, without quotes, that when present signifies that the coordinate arrays are to be printed to the list file. This option is only available in MODFLOW-OWHM. LAYCBD—is a flag, with one value for each model layer, that indicates whether or not a layer has a Quasi-3D confining bed below it. 0 indicates no confining bed, and not zero indicates a confining bed. LAYCBD for the bottom layer must be 0. DELR—is the cell width along rows. Read one value for each of the NCOL columns. This is a multi-value one-dimensional variable with one value for each column. 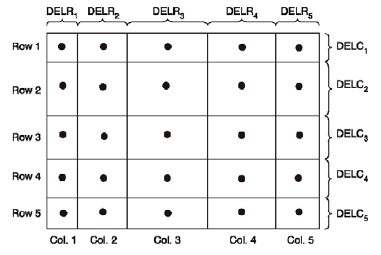 Finite difference grid illustrating DELR and DELC. DELC—is the cell width along columns. Read one value for each of the NROW rows. This is a multi-value one-dimensional variable with one value for each row. Top—is the top elevation of layer 1. For the common situation in which the top layer represents a water-table aquifer, it may be reasonable to set Top equal to land-surface elevation. Item 6 is repeated for each model layer and Quasi-3D confining bed in the grid. These layer variables are read in sequence going down from the top of the system. Thus, the number of BOTM arrays must be NLAY plus the number of Quasi-3D confining beds. BOTM—is the bottom elevation of a model layer or a Quasi-3d confining bed. PERLEN—is the length of a stress period. NSTP—is the number of time steps in a stress period. Ss/tr—is a character variable that indicates if the stress period is transient or steady state. The only allowed options are “SS” and “TR”, but these are case insensitive. If the SWI2 package is used, it is important to recognize that the steady-state head option does not mean that the steady-state density distribution is computed. The steady-state density distribution can only be computed by running the simulation until the density distribution is no longer changing. STARTTIME The Discretization package (DIS) was modified to optionally read an initial decimal year that represents the start of the simulation. This option is only available in MODFLOW-OWHM. This starting date is updated and printed along with an estimate of the month based on leap/non-leap year to the list file’s Time Summary. To set the starting decimal year, the keyword, STARTTIME, followed by the year is added to the end of the first read of Data Set 7. The update to the decimal year makes the appropriate conversions based on the time step scale and assumes there are 365.242 days in a year. Below is a DIS example of Data Set 7 with a starting date of 1949.7479 (Oct, 1, 1949). Note that the transient simulation then starts in October of 1950. For general reference the following is a reference table for each month’s fraction of a year.